This 2013 annual report identifies 31 areas where agencies may be able to achieve greater efficiency or effectiveness. Within these 31 areas, we include 17 areas of fragmentation, overlap, or duplication where multiple programs and activities may be creating inefficiencies. Although it may be appropriate for multiple agencies or entities to be involved in the same programmatic or policy area due to the nature or magnitude of the federal effort. The report also includes 14 areas where opportunities exist to achieve cost savings or enhance revenue collections. To address the issues indentified in these areas, we suggest 81 actions that the executive branch or Congress could take to reduce or eliminate fragmentation, overlap, or duplication or to achieve other financial benefits. Given that the areas identified extend across the government and that we found a range of conditions among these areas, we suggest a similarly wide range of actions for the executive branch and Congress to consider. For example, the actions we suggest in the report include, among many others, canceling a demonstration program, strengthening oversight of certain payments and investments, and limiting or reducing subsidies for a particular program. This third annual report for 2013 identifies 31 areas where agencies may be able to achieve greater efficiencies or effectiveness. Within these 31 areas, we identify 81 actions that the executive branch and Congress could take to reduce fragmentation, overlap, or duplication, as well as other cost savings or revenue enhancement opportunities. As the fiscal pressures facing the nation continue, so too does the need for executive branch agencies and Congress to improve the efficiency and effectiveness of government programs and activities. Opportunities to take such action exist in areas where federal programs or activities are fragmented, overlapping, or duplicative. To highlight these challenges and to inform government decision makers on actions that could be taken to address them, GAO is statutorily required to identify and report annually to Congress on federal programs, agencies, offices, and initiatives, either within departments or government-wide, that have duplicative goals or activities.1 In light of todays challenging fiscal environment, we have also identified additional opportunities to achieve greater efficiency and effectiveness by means of cost savings or enhanced revenue collection. In March 2011, we issued our first annual report in this series, which presented 80 areas where opportunities existed for executive branch agencies or Congress to reduce fragmentation, overlap, or duplication; achieve cost savings; or enhance revenue.2 Figure 1 outlines the definitions we use for fragmentation, overlap, and duplication for this work. In February 2012, we issued our second annual report, which identified an additional 51 areas. In these two reports, we have identified a total of approximately 300 actions that executive branch agencies and Congress could take to improve the efficiency and effectiveness of government programs and activities. This third annual report for 2013 identifies an additional 31 areas where agencies may be able to achieve greater efficiency or effectiveness. Within these 31 areas, we identify 81 actions that the executive branch or Congress could take to reduce fragmentation, overlap, or duplication, as well as other cost savings or revenue enhancement opportunities. In addition to identifying new areas, we have continued to monitor the progress executive branch agencies and Congress have made in addressing the areas we previously identified. With the release of this report, we are also concurrently launching GAOs Action Tracker, a publicly accessible website containing the status of actions suggested in our first three reports. The website will allow executive branch agencies, Congress, and the public to track the progress the government is making in addressing the issues we have identified. Section I of this report presents 17 new areas in which we found evidence that fragmentation, overlap, or duplication exists among federal programs or activities. Although it may be appropriate for multiple agencies or entities to be involved in the same programmatic or policy area due to the nature or magnitude of the federal effort, the instances of fragmentation, overlap, or duplication we describe in Section I occur in areas where multiple programs and activities may be creating inefficiencies. Section II describes 14 new areas where the federal government may achieve cost savings or enhance revenue collections. This report is based upon work GAO previously conducted in accordance with generally accepted government auditing standards. See appendix II for more information on our scope and methodology. In this report, we first identify 17 areas in which we found evidence of fragmentation, overlap, or duplication among federal programs or activities. These areas cover a broad range of government missions and functions. Section I of this report discusses all of these areas in greater detail. We consider programs or activities to be fragmented when more than one federal agency (or more than one organization within an agency) is involved in the same broad area of national need and opportunities may exist to improve how the government delivers services. We identified fragmentation in multiple programs we reviewed. For example, we found that the Department of Defenses (DOD) fragmented approach to developing and acquiring uniforms could be more efficient. Since 2002, the military services have shifted from using two camouflage patterns to seven service-specific camouflage uniforms with varying patterns and colors. Although DOD established a board to help ensure collaboration and DOD-wide integration of clothing and textile activities, we continue to identify inefficiencies in DODs uniform acquisition approach. We have identified several actions DOD should take to realize potential efficiencies and up to $82 million in development and acquisition cost savings through increased collaboration among the military services. These actions include directing the Secretaries of the military departments to actively pursue partnerships for the joint development and use of uniforms, as well as identifying and implementing actions necessary to enable the board to develop and issue joint criteria for uniforms prior to the development or acquisition of any new camouflage uniform. Similarly, we found DOD obligated over $6.8 billion from fiscal years 2008 through 2012 on contracts to acquire a range of foreign language services and products, such as translation and interpretation services. Although DOD has gained some efficiencies by centralizing contracting for certain services under an executive agent, it has not taken steps to comprehensively assess whether additional opportunities exist to gain efficiencies in fragmented contracts for foreign language support, which are estimated to cost more than $1 billion annually. Our prior work has found that agencies, including DOD, reported savings ranging between 5 and 20 percent by implementing more coordinated acquisition approaches rather than fragmented contracting. Given the departments level of obligations for foreign language support services, DOD could achieve significant cost savings by assessing and addressing the fragmentation in its current approach for managing these contracts. In some of the programs and activities where there was fragmentation, we also found instances of overlap. Overlap occurs when multiple agencies or programs have similar goals, engage in similar activities or strategies to achieve them, or target similar beneficiaries. We found overlap among federal programs or initiatives in a variety of areas such as joint veterans and defense health care services, export promotion activities, drug abuse prevention and treatment programs, and veterans employment and training programs, among others. For example, within the Department of Homeland Security (DHS), we found six department components involved in research and development activities. We examined 50 research and development contracts awarded by these components and found 35 instances among 29 contracts in which the contracts overlapped with activities conducted elsewhere in the department. Taken together, these 29 contracts were worth about $66 million. An example of the overlap we found: two DHS components awarded five separate contracts that each addressed detection of the same chemical. Moreover, DHS did not have the policies and mechanisms necessary to coordinate or track research and development activities across the department. Without adequate coordination, components may engage in overlapping research and development activities. To prevent such overlap of efforts, we suggested that DHS develop and implement policies and guidance for defining and overseeing research and development. In other instances we found evidence of duplication, which occurs when two or more agencies or programs are engaged in the same activities or provide the same services to the same beneficiaries. Our 2013 report includes several areas where we identified potentially duplicative federal efforts, such as rural water infrastructure programs. Moreover, in some of these areasincluding catfish inspection and geospatial investmentswe identified financial benefits that may result if executive branch agencies or Congress took action to address the issues we discuss. For example, we identified duplication in the Medicaid Integrity Program, which provides federal support and oversight of state programs.3 Specifically, we identified duplication in two Medicaid Integrity program activities: (1) the National Medicaid Audit Program, which consists of audits of state Medicaid claims data to identify overpayments, and (2) state program integrity assessments, one of several tools through which the Centers for Medicare & Medicaid Services (CMS) collects data on state program integrity activities. To address this duplication, we suggested that CMS merge certain functions of the federal review and audit contractors and discontinue the annual state program integrity assessment to eliminate or avoid duplicative activities. We report concerns about CMSs Medicare Advantage Quality Bonus Payment Demonstration, which will cost $8.35 billion over 10 years, most of which will be paid to plans with average performance. Medicare Advantage provides health care coverage through private health plans offered by organizations under contract with CMS. The agencys stated research goal for the demonstration is to test whether an alternative bonus structure leads to larger and faster annual quality improvement for Medicare Advantage plans. We found that the demonstrations design precludes a credible evaluation of its effectiveness because it lacks an appropriate comparison group needed to isolate the demonstrations effects, and because the demonstrations bonus payments are based largely on plan performance that predates the demonstration. Based on these concerns, we suggest that HHS cancel the Medicare Advantage Quality Bonus Payment Demonstration. In addition, the demonstrations design raises legal concerns about whether it falls within the Department of Health and Human Services (HHS) demonstration authority. Although the demonstration is now in its second year, HHS still has an opportunity to achieve significant cost savingsabout $2 billion, based on GAOs analysis of CMS actuaries estimatesif it cancels the demonstration for 2014. Additional cost savings and increased revenue collections may be realized by improving the Internal Revenue Services (IRS) enforcement of tax laws. IRS has estimated that the net tax gapthe difference between taxes owed and taxes paid on time or recoveredwas $385 billion for tax year 2006 (the most recent year for which data were available). To help reduce this gap, in fiscal year 2012, Congress appropriated $7.5 billion to IRS for its enforcement and taxpayer service activities. Notwithstanding IRSs enforcement and service programs, the net tax gap remains large. To help close this gap, we have identified several areas where IRS can improve its programs, reduce its costs, and facilitate voluntary compliance with existing tax laws. For example, we suggested that IRS should complete a broad strategy, including a timeline and performance measures, for how it intends to use information collected to improve tax compliance. These and other actions we have identified could help the federal government increase revenue collections by billions of dollars. As we have previously reported, the net tax gap has been a persistent problem and reducing it will require applying multiple strategies over a sustained period of time.4 One such strategy is additional information reporting. Taxpayers are much more likely to report their income accurately when the income is also reported to IRS by a third party. By matching information received from third-party payers with what payees report on their tax returns, IRS can detect income underreporting, including the failure to file a tax return. Additionally, taxpayers who rent out real estate are required to report to IRS expense payments for certain services, such as payments for property repairs, only if their rental activity is considered a trade or business. Expanding third-party information reporting on rental real estate service payments and service payments to corporations could increase revenues by an estimated $5.9 billion over 10 years, according to the Joint Committee on Taxation. Opportunities may also exist for the Department of Energy (Energy) to generate additional revenue by increasing the price for isotopes that it sells to commercial customers.5 Energys Isotope Development and Production for Research and Applications program (Isotope Program) sells isotopes to commercial customers for a variety of uses, such as medical procedures and radiation detection equipment. To achieve its mission, the Isotope Program relies on annual appropriations and revenues from isotope sales. Although revenues from sales of isotopes alone totaled over $25 million in fiscal year 2012, we found that Energy may be forgoing revenue because it is not using thorough assessments to set prices for commercial isotopes. Thus, we suggested that Energy examine the prices it sets for commercial isotopes to determine if prices can be increased. Improving planning: Given the crosscutting policy areas included in this report, planning is an important action in helping federal agencies address challenges, particularly those related to fragmentation, overlap, or duplication. Planning can help federal agencies manage their programs more effectively and guide progress in achieving desired results. For example, we report that a total of 31 federal departments and agencies invest an estimated billions of dollars to collect, maintain, and use geospatial informationinformation linked to specific geographic locations that supports many government functions, such as maintaining roads and responding to natural disasters. We found that federal agencies had not effectively implemented policies and procedures that would help them to identify and coordinate geospatial data acquisitions across the government. As a result, the agencies make duplicative investments and risk missing opportunities to jointly acquire data. Better planning and coordination among federal agencies could help reduce duplicative investments and provide the opportunity for potential savings of millions of dollars. Measuring performance and results: Performance measurement, because of its ongoing nature, can serve as an early warning system to management and a vehicle for improving accountability to the public. To ensure that their performance information will be both useful and used by decision makers, agencies need to consider the differing information needs of various usersincluding those in Congress. As we have previously reported, agency performance information must meet Congresss needs for completeness, accuracy, validity, timeliness, and ease of use to be useful for congressional decision making.6 Similarly, in this report, we find that better evaluation of performance and results is needed for multiple federal programs and activities to help inform decisions about how to address the fragmentation, overlap, or duplication identified. For example, federal agencies could achieve significant cost savings annually by expanding and improving their use of strategic sourcinga contracting process that moves away from numerous individual procurement actions to a broader aggregated approach. We have reported that a reduction of 1 percent from selected agencies procurement spending would equate to over $4 billion in savings.7 However, a lack of clear guidance on metrics for measuring success has hindered the management of ongoing strategic sourcing efforts across the federal government. By establishing metrics to measure progress toward goals and identifying spending categories most suitable for strategic sourcing, the Office of Management and Budget (OMB) can help federal agencies better implement strategic sourcing practices and maximize their ability to realize billions of dollars in potential savings annually. Improving management oversight: When issues span multiple organizations or multiple entities within an organization, improved management oversight is needed to avoid potential overlap and duplication. For example, although OMB guidance calls for agencies to analyze whether their information technology investments are continuing to meet business and customer needs and are contributing to meeting the agencys strategic goals, we found that agencies did not conduct such an analysis on 52 of the 75 major existing information technology investments we reviewed.8 As a result, there is increased potential for these information technology investments in operations and maintenancetotaling $37 billion in fiscal year 2011to result in waste and duplication. To avoid wasteful or duplicative investments in operations and maintenance, we suggest that agencies analyze all information technology investments annually and report the results of their analyses to OMB. These actions could help agencies achieve cost savings by strengthening the oversight of their existing information technology investments in operations and maintenance, resulting in the potential for billions of dollars in savings. Similarly, we found that many states are making Medicaid payments to many providers that are far in excess of those providers costs of providing Medicaid services. Specifically, 39 states made payments to certain providers in excess of Medicaid costs by a total of about $2.7 billion. To improve the transparency of and accountability for certain high-risk Medicaid payments, we suggest that Congress consider requiring CMS to take steps that would facilitate the agencys ability to oversee these payments, including identifying payments that are not used for Medicaid purposes or are otherwise inconsistent with Medicaid payment principles. Such action could lead to cost savings in the hundreds of millions, or even billions, of dollars. Enhancing interagency coordination and collaboration: When executive branch agencies carry out activities in a fragmented and uncoordinated way, the resulting patchwork of programs can waste scarce funds, confuse and frustrate program customers, and limit the overall effectiveness of the federal effort. Our report includes several areas in which improved interagency coordination and collaboration could help agencies better leverage limited resources or identify opportunities to operate more efficiently. For example, the Department of Veterans Affairs (VA) and DOD operate two of the nations largest health care systems, together providing health care to nearly 16 million veterans, service members, military retirees, and other beneficiaries at estimated costs for fiscal year 2013 of about $53 billion and $49 billion, respectively. As part of their health care efforts, the departments have established collaboration siteslocations where the two departments share health care resources through hundreds of agreements and projectsto deliver care jointly with the aim of improving access, quality, and cost-effectiveness of care. However, we found that the departments do not have a fully developed and formalized process for systematically identifying all opportunities for new or enhanced collaboration, potentially missing opportunities to improve health care access, quality, and costs. As another example, we report that unlike many farm programs, the Federal Crop Insurance program, which provides subsidies to pay for part of a farmers crop insurance premium, does not have statutory income and payment limits. Congress could achieve up to $1.2 billion per year in cost savings by limiting the subsidy for premiums that an individual farmer can receive each year, reducing the subsidy for all or high-income farmers participating in the program, or some combination of both. Congress could also consider taking action to help reduce the tens of billions of dollars spent each year developing and launching U.S. government satellite systems. To save money, several federal agencies are actively using or exploring nontraditional approaches to managing their space-based programs, such as developing public-private partnerships and hosting government capabilities on commercial spacecraft.10 While these approaches hold promise for providing lower-cost access to space in the future, there are also a variety of technical, cultural, logistical, legal, and policy challenges. For example, federal law and policy have limited the governments access to some hosted payload arrangements where government instruments are placed on commercial satellites, and ride sharing arrangements where multiple satellites share the same launch vehicle. We identify actions that Congress may wish to consider to address these legal challenges and better take advantage of nontraditional approaches. Note: In assessing overall progress for an area, we determined that an area was addressed if all actions in that area were addressed; partially addressed if at least one action needed in that area showed some progress toward implementation but not all actions were addressed; and not addressed if none of the actions needed in that area was addressed or partially addressed. In assessing actions suggested for Congress, we applied the following criteria: addressed means relevant legislation has been enacted and addresses all aspects of the action needed; partially addressed means a relevant bill has passed a committee, the House of Representatives, or the Senate, or relevant legislation has been enacted but only addressed part of the action needed; and not addressed means a bill may have been introduced but did not pass out of a committee, or no relevant legislation has been introduced. In assessing actions suggested for the executive branch, we applied the following criteria: addressed means implementation of the action needed has been completed; partially addressed means the action needed is in development, or started but not yet completed; and not addressed means the administration, the agencies, or both have made minimal or no progress toward implementing the action needed. Consolidated areas and actions were not assessed this year due to additional work or other information GAO considered. See appendix II for more information. An example of the progress made is DODs efforts to implement our suggested action related to the area of overseas defense posture. Specifically, in our 2012 annual report, we suggested the Secretary of Defense should direct appropriate organizations within DOD to complete a business case analysis, including an evaluation of alternative courses of action, for the strategic objectives that have to this point driven the decision to implement tour normalization in South Koreathat is, a DOD initiative to transform its defense posture in South Korea. Based on the resulting business case analysis, DOD officials stated that United States Forces Korea determined that the tour normalization initiative was not affordable. This decision not to move forward with the tour normalization initiative resulted in cost avoidance of $3.1 billion from fiscal years 2012 through 2016. Congress has also taken steps to address some of our suggested actions. For example, in our 2011 annual report, we stated that Congress could reduce revenue losses by more than $5.7 billion annually by addressing duplicative federal efforts directed at increasing domestic ethanol production. To reduce these revenue losses, we suggested that Congress consider whether revisions to the ethanol tax credit were needed and we suggested options to consider, including allowing the volumetric ethanol excise tax credit to expire at the end of 2011. Congress allowed the tax credit to expire at the end of 2011, which ended the ethanol tax credit for fuel blenders that purchase and blend ethanol with gasoline. Although the executive branch and Congress have made some progress in addressing the issues that we have previously identified, additional steps are needed to address the remaining areas to achieve associated benefits. A number of the issues are difficult to address, and implementing many of the actions identified will take time and sustained leadership. Table 1 outlines selected actions that we reported in 2011 and 2012 that, when addressed, may result in or lead to cost savings or enhanced revenue. a As of March 6, 2013. ◐ = Partially addressed, meaning at least one action needed in that area showed some progress toward implementation, but not all actions were addressed. ○ = Not addressed, meaning none of the actions needed in that area were addressed. To help maintain attention on these issues, as mentioned earlier, we are concurrently releasing GAOs Action Tracker,, a publicly accessible, online website of the 162 areas and approximately 380 actions needed presented in our 2011, 2012, and 2013 reports. GAOs Action Tracker, includes progress updates and assessments of legislative and executive branch actions needed. We will add areas and suggested actions identified and future reports to GAOs Action Tracker, and periodically update the status of all identified areas and activities. Our 2013 annual report completes our 3-year systematic examination across the federal government to identify major instances of fragmentation, overlap, or duplication. Through our three annual reports, we have identified a total of 162 areas with actions that the executive branch and Congress could take to address fragmentation, overlap, and duplication or achieve cost savings (see app. III). Collectively, these reports show that, if the actions are implemented, the government could potentially save tens of billions of dollars annually. These three reports touch on areas in virtually all major federal departments and agencies. Specifically, the reports collectively identify opportunities to reduce fragmentation, overlap, and duplication or achieve other financial benefits within all 15 cabinet-level executive departments and at least 17 other federal entities. Figure 3 illustrates actions needed that we directed to federal departments and agencies in our three annual reports. As the figure shows, we have directed numerous actions to large federal departments and agencies that represent the majority of the federal obligations, including 90 actions directed to DOD, 51 to Treasury, and 44 to HHS, representing 56 percent of fiscal year 2011 obligations. aU.S. Postal Service obligations are primarily funded by postal revenues, although the U.S. Postal Service receives minimal appropriations for overseas voting and mail for the blind. Additionally, the U.S. Postal Service has a maximum $15 billion in borrowing authority. bTreasurys percentage of fiscal year 2011 obligations includes interest on the national debt. Note: Individual actions needed are counted multiple times, when they are directed to more than one federal department or agency. Our systematic examination required a multiphased approach. First, we reviewed the budget functions of the federal government representing nearly all of the overall federal funds obligated in fiscal year 2010.14 Because federal budget functions classify budget resources by national need (such as National Defense, Energy, and Agriculture), instances in which multiple federal agencies obligate funds within a particular budget function may indicate potential duplication or cost savings opportunities (see fig. 4 for spending patterns by executive branch agency and budget function). Although this type of analysis cannot answer the question of whether overlap or fragmentation existsnor indicate whether the overlap identified is duplicativeit can help in the selection of areas for further investigation. Using this information, we identified each instance in which an executive branch or independent agency obligated more than $10 million within these 18 budget functions for further consideration. aTwo budget functions are not shown above: Allowances, because there are no 2010 actual obligations, and Undistributed Offsetting Receipts, because no obligations are charged to agencies. Second, we reviewed key agency documents, such as strategic plans, performance and accountability reports, and budget justifications, as we have found that when multiple executive branch agencies have similar missions, goals, or programs, the potential for fragmentation, overlap, or duplication exists. Third, we reviewed key external published sources of information. In particular, we reviewed reports published by the Congressional Budget Office, Inspectors General, and the Congressional Research Service, as well as the Presidents budgets, to identify potential overlap and duplication among agency missions, goals, and programs.15 We relied on our previous work and professional judgment to target areas for further review by considering a variety of factors, including the extent of potential cost savings; opportunities for enhanced program efficiency or effectiveness; the degree to which multiple programs may be fragmented, overlapping, or duplicative; whether issues had been identified by GAO or external sources; and the level of coordination among agency programs. Based on our multiphased approach, we have identified, to date, 162 areas in which there are opportunities to reduce fragmentation, overlap, or duplication or to achieve cost savings or revenue enhancement. The areas included in our reports, however, do not represent the full extent of our systematic evaluation; we evaluated many additional areas but determined for various reasons that the available evidence did not support their inclusion at this time. The federal inmate reentry grant programs administered by the Departments of Justice, Labor, and Health and Human Services illustrate this point. Although the federal programs are fragmented, we found that overlap is minimal and the risk of duplication is low because the programs vary across eligible applicants, beneficiaries, and primary services. Moreover, the departments have taken steps to coordinate their reentry efforts to prevent duplication and share promising practices. As another example, we examined the extent to which functions or activities provided under DODs civil augmentation programswhich are designed to help meet the military services logistics requirements during operationsare potentially fragmented, overlapping, or duplicative. We found no instances of overlap or duplication in the implementation of these programs. Further, we examined the cost or savings implications of consolidating the planning, execution, and oversight of the civil augmentation programs and did not identify clear opportunities to improve the effectiveness or efficiency of the programs. In still other instances, agencies took steps to address issues we identified during the course of our audit work. For example, through our review of the federal governments aerostat and airship acquisition efforts, we identified two concurrent and potentially duplicative airship development effortsone was being developed by the U.S. Army and the other by the U.S. Air Force. However, the potential duplication ended before we issued our report when the Air Force terminated its program due to technical problems experienced with the airframe and the need to avoid the efforts substantially increasing costs. We were not able to determine any cost savings that resulted from the programs termination because the Air Force had not budgeted for program costs beyond fiscal year 2012. In addition, in February 2013 the U.S. Army terminated its effort because of schedule delays and increasing costs. The U.S. Army had budgeted approximately $80 million between fiscal years 2013 and 2015 for this effort. Although our three annual reports provide extensive coverage across the federal government, the areas identified in our annual reports are not intended to represent every instance of fragmentation, overlap, or duplication within the federal government. As statutorily required, we will continue to identify new issues for executive branch agencies and Congress to consider. Likewise, we will continue to monitor developments in the areas we have already identified in this series. During the past two decades, our work on managing for results has suggested how effective implementation of the Government Performance and Results Act of 1993 (GPRA) could improve collaboration to achieve meaningful results. Congress used our work in crafting the GPRA Modernization Act of 2010 (GPRAMA), which updates GPRA to establish a framework aimed at taking a more crosscutting and integrated approach to focusing on results and improving government performance.16 Effective implementation of GPRAMA could help clarify desired outcomes, address program performance spanning multiple organizations, and facilitate future actions to reduce fragmentation, overlap, and duplication. Moreover, effective implementation could help address challenges to identifying and addressing the areas of fragmentation, overlap, and duplication we highlight in this series. These challenges include the lack of a comprehensive list of federal programs and funding information and the need for improved and regular performance information. GPRAMA, if effectively implemented, could help address these challenges as well as improve information sharing and coordination among federal agenciesboth of which are needed to help address issues of fragmentation, overlap, and duplication. To help address these challenges, GPRAMA requires the Director of OMB to compile and make publicly available a comprehensive list of all federal programs, and to include the purposes of each program, how it contributes to the agencys mission, and recent funding information. According to OMB, agencies currently use the term program in different ways, and OMB plans to allow them to continue to define programs in ways that reflect their particular facts and circumstances within prescribed guidelines.18 OMB expects 24 large federal agencies to publish an initial inventory of federal programs by May 2013.19 In future years, this effort will be expanded to other agencies that will update their inventories annually to reflect the annual budget and appropriations process. OMB also expects to enhance the initial program inventory by collecting related information, such as financing and related agency strategic goals. Second, this series calls repeated attention to challenges associated with the need for improved and regular performance information. The regular collection and review of performance information, both within and among federal agencies, could help executive branch agencies and Congress determine whether some of the federal programs or initiatives included in this series are making progress toward addressing the identified issues and could determine the actions that need to be taken to improve results. However, as we previously noted, our annual reports highlight several instances in which executive branch agencies do not collect necessary performance data. For example, in our 2011 annual report we noted that OMB has not used its budget and performance review processes to systematically review tax expenditures and promote integrated reviews of related tax and spending programs. Coordinated performance reviews of tax expenditures with related federal spending programs could help policymakers reduce overlap and inconsistencies and direct scarce resources to the most effective or least costly methods to deliver federal support. Similarly, we have previously reported that as Congress oversees federal programs and activities, it needs pertinent and reliable information to adequately assess agencies progress, ensure accountability, and understand how individual programs and activities fit within a broader portfolio of federal efforts. The lack of reliable performance data also makes it difficult for decision makers to determine how to address identified fragmentation, overlap, or duplication. GPRAMA requires that federal agencies regularly collect performance information for federal programs and ensure that it is made publicly available. Specifically, agency leaders are required to conduct quarterly, data-driven reviews of their performance in achieving priority goals and identify strategies to improve performance where goals are not being met. In addition, OMB has directed agencies to take our work in this series into consideration when establishing their budget and management plans. As we recently reported, according to our survey of Performance Improvement Officers in 24 agencies, all 24 agencies were conducting performance reviews at least quarterly as required by GPRAMA.20 While we found the reviews have shown promise in improving internal agency coordination and collaboration, few agency Performance Improvement Officers reported they are using the reviews to coordinate or collaborate with other agencies that have similar goals. We recommended that the Director of OMB identify and share promising practices for including other relevant entities that contribute to achieving their agency performance goals. OMB agreed with our recommendation. Congressional use of agency goals and measured results in its decision making will send an unmistakable message to agencies that Congress considers agency performance a priority. For example, in our 2011 annual report, we noted that the federal government distributed surface transportation funding without regard to performance. However, in July 2012, the Moving Ahead for Progress in the 21st Century Act (MAP-21) was enacted, reauthorizing surface transportation programs through 2014.28 This law identified seven national performance goals for surface transportation and requires the Secretary of Transportation to establish performance measures for them. In addition, states must establish performance targets for those measures and report their progress in achieving them, thereby incorporating accountability for results. Moreover, MAP-21 links funding to performance by requiring states to use federal funds to improve interstate system pavement and bridge conditions to meet minimum standards. Realizing the intent of GPRAMA for improving government performance and accountability and reducing fragmentation, overlap, and duplication will require sustained oversight of implementation. To assist Congress with this oversight, GPRAMA includes provisions requiring us to review its implementation at several critical junctures. First, following a period of initial implementation, we are to report by June 2013 on implementation of GPRAMAs planning and reporting requirements, at both the government-wide and agency levels. Subsequently, following full implementation, we are to evaluate by September 2015 and 2017 whether performance management is being used by federal agencies to improve the efficiency and effectiveness of agency programs. Also in September 2015 and 2017and every 4 years thereafterwe are to evaluate the implementation of the federal government priority goals and performance plans and related reporting required by GPRAMA. This report was prepared under the coordination of Orice Williams Brown, Managing Director, Financial Markets and Community Investment, who may be reached at (202) 512-8678 or williamso@gao.gov, and A. Nicole Clowers, Director, Financial Markets and Community Investment, who may be reached at (202) 512-8678 or clowersa@gao.gov. Specific questions about individual issues may be directed to the area contact listed at the end of each summary. This report is divided into two sections. Section I of this report presents 17 areas in which we found evidence of fragmentation, overlap, or duplication among federal government programs. Section II of this report summarizes 14 additional opportunities for agencies or Congress to consider taking action that could either reduce the cost of government operations or enhance revenue collections for the Treasury. Agriculture 1. Catfish Inspection Repealing provisions of the 2008 Farm Bill that assigned U.S. Department of Agriculture's Food Safety and Inspection Service responsibility for examining and inspecting catfish and for creating a catfish inspection program would avoid duplication of federal programs and could save taxpayers millions of dollars annually without affecting the safety of catfish intended for human consumption. Defense 2. Combat Uniforms The Department of Defense’s fragmented approach to developing and acquiring uniforms could be more efficient, better protect service members, and result in up to $82 million in savings in development and acquisition cost savings through increased collaboration among the military services. Defense 3. Defense Foreign Language Support Contracts The Department of Defense should explore opportunities to gain additional efficiencies in contracts for foreign language support, which is estimated to cost more than $1 billion annually, by addressing fragmentation in the department’s acquisition approach. Energy 4. Renewable Energy Initiatives Federal support for wind and solar energy, biofuels, and other renewable energy sources, which has been estimated at several billion dollars per year, is fragmented because 23 agencies implemented hundreds of renewable energy initiatives in fiscal year 2010—the latest year for which GAO developed these original data. Further, the Departments of Energy and Agriculture could take additional actions—to the extent possible within their statutory authority—to help ensure effective use of financial support from several wind initiatives, which GAO found provided duplicative support that may not have been needed in all cases for projects to be built. Health 5. Joint Veterans and Defense Health Care Services The Departments of Veterans Affairs and Defense should enhance their collaboration to reduce costs, overlap, and potential duplication in the delivery of health care services. Health 6. Medicaid Program Integrity The Centers for Medicare & Medicaid Services needs to take steps to eliminate duplication and increase efficiency in two Medicaid Integrity Program activities—provider audits and the collection of state program integrity data. Homeland Security/Law Enforcement 7. Department of Homeland Security Research and Development Better policies and guidance for defining, overseeing, and coordinating research and development investments and activities would help the Department of Homeland Security address fragmentation, overlap, and potential unnecessary duplication. Homeland Security/Law Enforcement 8. Field-Based Information Sharing To help reduce inefficiencies resulting from overlap in analytical and investigative support activities, the Departments of Justice and Homeland Security and the Office of National Drug Control Policy could improve coordination among five types of field-based information sharing entities that may collect, process, analyze, or disseminate information in support of law enforcement and counterterrorism-related efforts—Joint Terrorism Task Forces, Field Intelligence Groups, Regional Information Sharing Systems centers, state and major urban area fusion centers, and High Intensity Drug Trafficking Areas Investigative Support Centers. Homeland Security/Law Enforcement 9. Justice and Treasury Asset Forfeiture Conducting a study to evaluate the feasibility of consolidating the Departments of Justice’s and Treasury’s multimillion dollar asset forfeiture activities could help the departments identify the extent to which consolidation of potentially duplicative activities would help increase the efficiency and effectiveness of the programs and achieve cost savings. Information Technology 10. Dissemination of Technical Research Reports Congress may wish to consider whether the fee-based model under which the National Technical Information Service currently operates for disseminating technical information is still viable or appropriate, given that many of the reports overlap with similar information available from the issuing organizations or other sources for free. Information Technology 11. Geospatial Investments Better coordination among federal agencies that collect, maintain, and use geospatial information could help reduce duplication of geospatial investments and provide the opportunity for potential savings of millions of dollars. International Affairs 12. Export Promotion Enhanced collaboration between the Small Business Administration and two other agencies could help to limit overlapping export-related services for small businesses. International Affairs 13. International Broadcasting The Broadcasting Board of Governors—with a budget of $752 million in fiscal year 2012—has recognized the need to reduce overlap and reallocate limited resources to broadcasts that will have the greatest impact, but the agency could do more to achieve this goal, such as systematically considering overlap of language services in its annual language services review. Science and the Environment 14. Rural Water Infrastructure Additional coordination by the Environmental Protection Agency and the Department of Agriculture could help three water and wastewater infrastructure programs with combined funding of about $4.3 billion avoid potentially duplicative application requirements, as well as associated costs and time developing engineering reports and environmental analyses. Social Services 15. Drug Abuse Prevention and Treatment Programs More fully assessing the extent of overlap and potential duplication across the fragmented 76 federal drug abuse prevention and treatment programs and identifying opportunities for increased coordination, including those programs where no coordination has occurred, would better position the Office of National Drug Control Policy to better leverage resources and increase efficiencies. Training, Employment, and Education 16. Higher Education Assistance Federal agencies providing assistance for higher education should better coordinate to improve program administration and help reduce fragmentation. Training, Employment, and Education 17. Veterans' Employment and Training The Departments of Labor, Veterans Affairs, and Defense need to better coordinate the employment services each provides to veterans, and Labor needs to better target the Disabled Veterans’ Outreach Program so that it does not overlap with other programs. Agriculture 18. Agricultural Quarantine Inspection Fees The United States Department of Agriculture's Animal and Plant Health Inspection Service could have achieved as much as $325 million in savings (based on fiscal year 2011 data, as reported in GAO’s March 2013 report) by more fully aligning fees with program costs; although the savings would be recurring, the amount would depend on the cost-collections gap in a given fiscal year and would result in a reduced reliance on U.S. Customs and Border Protection’s annual Salaries and Expenses appropriations used for agricultural inspection services. Agriculture 19. Crop Insurance To achieve up to $1.2 billion per year in cost savings in the Federal Crop Insurance program, Congress could consider limiting the subsidy for premiums that an individual farmer can receive each year, reducing the subsidy for all or high-income farmers participating in the program, or some combination of limiting and reducing these subsidies. Defense 20. Joint Basing The Department of Defense needs an implementation plan to guide joint bases to achieve millions of dollars in cost savings and efficiencies anticipated from combining support services at 26 installations located close to one another. Energy 21. Department of Energy's Isotope Program Assessing the value of isotopes to customers, and other factors such as prices of alternatives, may show that the Department of Energy could increase prices for isotopes that it sells to commercial customers to create cost savings by generating additional revenue. General Government 22. Additional Opportunities to Improve Internal Revenue Service Enforcement of Tax Laws The Internal Revenue Service can realize cost savings and increase revenue collections by billions of dollars by, among other things, using more rigorous analyses to better allocate enforcement and other resources. General Government 23. Agencies' Use of Strategic Sourcing Selected agencies could better leverage their buying power and achieve additional savings by directing more procurement spending to existing strategically sourced contracts and further expanding strategic sourcing practices to their highest spending procurement categories—savings of 1 percent from selected agencies’ procurement spending alone would equate to over $4 billion. General Government 24. Opportunities to Help Reduce Government Satellite Program Costs Government agencies could achieve considerable cost savings on some missions by leveraging commercial spacecraft through innovative mechanisms such as hosted payload arrangements and sharing launch vehicle costs. Selected agencies have reported saving hundreds of millions of dollars to date from using these innovative mechanisms. Health 25. Medicare Prepayment Controls More widespread use of prepayment edits could reduce improper payments and achieve other cost savings for the Medicare program, as well as provide more consistent coverage nationwide. Health 26. Medicaid Supplemental Payments To improve the transparency of and accountability for certain high-risk Medicaid payments that annually total tens of billions of dollars, Congress should consider requiring the Centers for Medicare & Medicaid Services to take steps that would facilitate the agency’s ability to oversee these payments, including identifying payments that are not used for Medicaid purposes or are otherwise inconsistent with Medicaid payment principles, which could lead to cost savings. GAO’s analysis of providers for which data are available suggests that savings could be in the hundreds of millions, or billions, of dollars. Health 27. Medicare Advantage Quality Bonus Payment Demonstration Rather than implementing the Medicare Advantage quality bonus payment program specifically established by law, the Centers for Medicare & Medicaid Services is testing an alternative bonus payment structure under a broad demonstration authority through a 3-year demonstration that has design flaws, raises legal concerns, and is estimated to cost over $8 billion; about $2 billion could be saved if it were canceled for its last year, 2014. Homeland Security/Law Enforcement 28. Checked Baggage Screening By reviewing the appropriateness of the federal cost share the Transportation Security Administration applies to agreements financing airport facility modification projects related to the installation of checked baggage screening systems, the Transportation Security Administration could, if a reduced cost share was deemed appropriate, achieve cost efficiencies and be positioned to install a greater number of optimal baggage screening systems than it currently anticipates. Information Technology 29. Cloud Computing Better planning of cloud-based computing solutions provides an opportunity for potential savings of millions of dollars. Information Technology 30. Information Technology Operations and Maintenance Strengthening oversight of key federal agencies’ major information technology investments in operations and maintenance provides opportunity for savings on billions in information technology investments. International Affairs 31. Tobacco Taxes Federal revenue losses were as much as $615 million to $1.1 billion between April 2009 and 2011 because manufacturers and consumers substituted higher-taxed smoking tobacco products with similar lower-taxed products. To address future revenue losses, Congress should consider modifying tobacco tax rates to eliminate significant tax differentials between similar products. This section presents 17 areas in which we found evidence of fragmentation, overlap, or duplication among federal government programs. This section summarizes 14 additional opportunities for agencies or Congress to consider taking action that could either reduce the cost of government operations or enhance revenue collections for the Treasury. Section 21 of Public Law 111-139, enacted in February 2010, requires GAO to conduct routine investigations to identify federal programs, agencies, offices, and initiatives with duplicative goals and activities within departments and government-wide. This provision also requires GAO to report annually to Congress on its findings, including the cost of such duplication, and recommendations for consolidation and elimination to reduce duplication and specific rescissions (legislation canceling previously enacted budget authority) that Congress may wish to consider.29 Our objectives in this report are to (1) identify what potentially significant areas of fragmentation, overlap, and duplication, as well as opportunities for cost savings and enhanced revenues, exist across the federal government; and (2) identify what options, if any, exist to minimize fragmentation, overlap, and duplication in these areas and take advantage of opportunities for cost savings and enhanced revenues. For the purposes of our analysis, we used the term "fragmentation" to refer to those circumstances in which more than one federal agency (or more than one organization within an agency) is involved in the same broad area of national need and there may be opportunities to improve how the government delivers these services. We used the term "overlap" when multiple agencies or programs have similar goals, engage in similar activities or strategies to achieve them, or target similar beneficiaries. 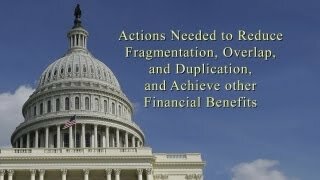 We considered "duplication" to occur when two or more agencies or programs are engaged in the same activities or provide the same services to the same beneficiaries.30 This report presents 17 areas of fragmentation, overlap, and duplication where greater efficiencies or effectiveness in providing government services may be achievable. In light of the long-term fiscal imbalances that the federal government faces, and consistent with our approach for the first annual report, we also highlighted 14 opportunities for potential cost saving or revenue enhancements. Examination of budget functions and subfunctions of the federal government: We examined OMBs MAX Information System31 data to identify and analyze which federal agencies obligated funds for budget functions and subfunctions, representing nearly all of the overall federal funds obligated in fiscal year 2010. Budget functions provide a system of classifying budget resources so that budget authority, outlays, receipts, and tax expenditures can be related to the national needs being addressed. Each budget account is generally placed in the single budget function (for example, national defense or health) that best reflects its major purpose, an important national need. A budget function may be divided into two or more subfunctions, depending on the complexity of the national need addressed. Because federal budget functions classify budget resources by important national need (such as National Defense, Energy, and Agriculture), identifying instances when multiple federal agencies obligate funds within a budget function or subfunction may indicate potential duplication or cost savings opportunities. Although this type of analysis cannot answer the question of whether fragmentation or overlap existsnor indicate whether the overlap shown is duplicativeit can help in the selection of areas for further investigation. Using this information, we identified each instance in which an executive branch or independent agency obligated more than $10 million within these 18 budget functions for further consideration. Examination of key agency documents: When multiple federal agencies have similar missions, goals or programs, the potential for unnecessary fragmentation, overlap, and duplication exists. As a result, we examined key agency documents such as strategic plans, performance and accountability reports, and budget justifications to determine and analyze their missions, goals or programs. Review of key external published sources: We reviewed key external published sources of information. For example, we reviewed reports published by the Congressional Budget Office, Inspectors General, and the Congressional Research Service. Because it is not practical to examine every instance of potential duplication or opportunities for cost savings across the federal government, we considered a variety of factors to determine whether such potential instances or opportunities were significant enough to require additional examination. Such factors included, but were not limited to, the extent of potential cost savings, opportunities for enhanced program efficiency or effectiveness, the degree to which multiple programs may be fragmented, overlapping, or duplicative, whether issues had been identified by GAO or external sources, and the level of coordination among agency programs. On the basis of this multiphased approach, we identified areas of potential fragmentation, overlap, and duplication and opportunities for costs savings or revenue enhancement. GAO programmed work to examine these areas for reporting in this or future annual reports. Each issue area contained in Sections I and II of this report lists any respective GAO reports and publications upon which it is based. Those prior GAO reports contain more detailed information on our supporting work and methodologies. For issues that update prior GAO work, we provide additional information on the methodologies used in that ongoing work or update in the section entitled How GAO Conducted Its Work of each issue area. To identify the potential financial and other benefits that might result from actions addressing fragmentation, overlap, and duplication as well as opportunities for cost savings and revenue enhancement, we collected and analyzed data on costs and potential savings to the extent it was available. Estimating the benefits that could result from eliminating unnecessary fragmentation, overlap, and duplication as well as opportunities for cost savings and revenue enhancement was not possible in some cases because information about the extent of duplication among certain programs was not available. Further, the financial benefits that can be achieved from fragmentation, overlap, and duplication as well as opportunities for cost savings and revenue enhancement were not always quantifiable in advance of congressional and executive branch decision making, and needed information was not readily available on, among other things, program performance, the level of funding devoted to overlapping programs, or the implementation costs and time frames that might be associated with program consolidations or terminations. When possible, we also included tables in appendix III that provide a detailed listing of federally-funded program names and associated budgetary information. While there is no standard definition for what constitutes a program, they may include grants, tax expenditures, centers, loans, funds, and other types of assistance. A wide variety of budgetary information may be used to convey the federal commitment to these programs. When available, we collected obligations information for fiscal year 2010 for consistent reporting across issue areas. In some instances, obligations data were not available, but we were able to report other budgetary information, such as appropriations. In other issue areas, we did not report any budgetary information, because such information was either not available or sufficiently reliable. For example, some agencies could not isolate budgetary information for some programs, because the data were aggregated at higher levels. We assessed the reliability of any computer-processed data that materially affected our findings, including cost savings and revenue enhancement estimates. The steps that GAO takes to assess the reliability of data vary but are chosen to accomplish the auditing requirement that the data be sufficiently reliable given the purposes it is used for in our products. GAO analysts review published documentation about the data system and Inspector General or other reviews of the data. GAO may interview agency or outside officials to better understand system controls and to assure ourselves that we understand how the data are produced and any limitations associated with the data. GAO may also electronically test the data to see if values in the data conform to agency testimony and documentation regarding valid values, or compare data to source documents. In addition to these steps GAO often compares data with other sources as a way to corroborate our findings. Per GAO policy, when data do not materially affect findings and are presented for background purposes only, we may not have assessed the reliability depending upon the context in which the data are presented. To examine the extent to which the legislative and executive branches have made progress in implementing the 131 areas we have reported on in previous annual reports on fragmentation, overlap, and duplication, we reviewed relevant legislation and documents such as budgets, policies, strategic and implementation plans, guidance, and other information related to the approximately 300 actions included in these previous reports.34 We also analyzed, to the extent possible, whether or not financial or other benefits have been attained, and included this information as appropriate. In addition, we discussed the implementation status of the areas with officials at the relevant agencies. Using the legislation and documentation collected from agencies, GAO analysts and specialists working on defense, domestic, and international areas assessed progress for each of the approximately 300 actions within their areas of expertise. A core group of GAO staff examined all assessments to ensure consistent and systematic application of the criteria, and made adjustments, as appropriate. We used the following criteria in assessing the status of areas and actions. We determined that an area was addressed if all actions in that area were addressed; partially addressed if at least one action needed in that area showed some progress toward implementation but not all actions were addressed; and not addressed if none of the actions needed in that area were addressed or partially addressed. In assessing legislative branch actions, we applied the following criteria: addressed means relevant legislation is enacted and addresses all aspects of the action needed; partially addressed means a relevant bill has passed a committee, the House of Representatives, or the Senate, or relevant legislation has been enacted but only addressed part of the action needed; and not addressed means a bill may have been introduced but did not pass out of a committee, or no relevant legislation has been introduced. In some instances, the 2013 assessment of a legislative branch action changed from partially addressed to not addressed. These instances occurred because we assessed the action as partially addressed in 2012 because a relevant bill passed committee during the 112th Congress; however, this year we assessed the action as not addressed because the relevant bill was not enacted into law before the end of the 112th Congress and no similar bill has passed out of committee in the 113th Congress as of March 6, 2013. In assessing executive branch actions we applied the following criteria: addressed means implementation of the action needed has been completed; partially addressed means the action needed is in development, started but not yet completed; and not addressed means the administration, the agencies, or both have made minimal or no progress toward implementing the action needed. GAO provided drafts of these assessments to the agencies involved for their technical comments and incorporated these comments, as appropriate. We incorporated a summary of comments on the prior GAO work upon which each issue area is based and also sought comments for each issue area from the agencies involved and incorporated their comments, as appropriate. Consistent with GAO policy, we are not reprinting copies of agencys comment letters with this report, as the work included is based predominantly on previously issued GAO reports. This report is based upon work GAO previously conducted in accordance with generally accepted government auditing standards. Those standards require that we plan and perform the audit to obtain sufficient, appropriate evidence to provide a reasonable basis for our findings and conclusions based on our audit objectives. We believe that the evidence obtained provides a reasonable basis for our findings and conclusions based on our audit objectives. Copies of agency comment letters associated with previous reports can be found in those reports, if applicable. 1) Pub. L. No. 111-139, § 21, 124 Stat. 29 (2010), 31 U.S.C. § 712 Note. See appendix I for the list of congressional addressees for this work. 2) In assessing progress on the 81 areas we identified in our 2011 annual report for this years report, we combined two areas related to the Department of Homeland Securitys management of acquisitions (Areas 75 and 76) into one area. Therefore, we are evaluating progress for 80 areas identified in our 2011 annual report and 51 areas identified in our 2012 annual report. See appendix II for additional information on scope and methodology. 3) Medicaid is the joint federal-state health care financing program for certain low-income individuals and is one of the largest social programs in federal and state budgets. We have had long-standing concerns about Medicaids program integrity because of problems with the sufficiency of federal and state oversight. For example, the Centers for Medicare & Medicaid Services estimated that in fiscal year 2012, $19.2 billion (7.1 percent) of Medicaids federal expenditures involved improper payments. 4) GAO, Tax Gap: IRS Could Significantly Increase Revenues by Better Targeting Enforcement Resources, GAO-13-151 (Washington, D.C.: Dec. 5, 2012). 5) Isotopes are varieties of a given chemical element with the same number of protons but different numbers of neutrons. For example, the helium-3 isotope, which is used in research and to detect neutrons in radiation detection equipment, has one less neutron than the helium-4 isotope, which is the helium isotope commonly used in party balloons. 6) GAO, Managing for Results: A Guide for Using the GPRA Modernization Act to Help Inform Congressional Decision Making, GAO-12-621SP (Washington, D.C.: June 15, 2012). 7) These selected agencies include DOD, DHS, Energy, and the Department of Veterans Affairs, which accounted for 80 percent of the $537 billion in federal procurement spending in fiscal year 2011. 8) Our review included major information technology investments at DOD, HHS, DHS, Treasury, and VA.
9) To create this potential savings, Congress would need to repeal the provision in the Food, Conservation, and Energy Act of 2008, or direct in the Food Safety and Inspection Services appropriation that no funds may be spent on the program. If Congress enacts a legislative restriction, there may be some opportunity to rescind appropriated amounts. Because the inspection program is funded from a lump sum appropriation to USDA, funds that would have been used for the program could be available for new obligations within the appropriations account. USDA could identify the amount of funds currently available for obligation that would have been used for the catfish inspection program and Congress could rescind those amounts. 10) Several federal agencies, including DOD, the National Aeronautics and Space Administration, the Federal Aviation Administration, the National Oceanic and Atmospheric Administration, and the U.S. Coast Guard, are actively using or beginning to look at these approaches in order to save costs. 11) An additional 9 actions reported in 2011 and 2012 were not assessed this year due to additional audit work or other information we considered. See appendix II for additional information on our scope and methodology for monitoring the progress of actions. 12) In assessing overall progress for an area, we determined that an area was addressed if all actions in that area were addressed; partially addressed if at least one action needed in that area showed some progress toward implementation but not all actions were addressed; and not addressed if none of the actions needed in that area were addressed or partially addressed. In addition, 1 area reported in 2011 was not assessed this year due to additional audit work or other information we considered. 13) In assessing actions suggested for Congress, we applied the following criteria: addressed means relevant legislation has been enacted and addresses all aspects of the action needed; partially addressed means a relevant bill has passed a committee, the House of Representatives, or the Senate, or relevant legislation has been enacted but only addressed part of the action needed; and not addressed means a bill may have been introduced but did not pass out of a committee, or no relevant legislation has been introduced. In assessing actions suggested for the executive branch, we applied the following criteria: addressed means implementation of the action needed has been completed; partially addressed means the action needed is in development, or started but not yet completed; and not addressed means the administration, the agencies, or both have made minimal or no progress toward implementing the action needed. 14) Our examination did not include two budget functions: Allowances, because there were no actual obligations, and Undistributed Offsetting Receipts, because no obligations are charged to agencies. 15) Our examination did not include the fiscal year 2014 Presidents budget because of the timing of its release. 16) Pub. L. No. 103-62, 107 Stat. 285 (1993); Pub. L. No. 111-352, 124 Stat. 3866 (2011). 17) In addition, see appendix IV for a listing of federal programs or other activities related to areas in this report, along with budgetary information, if available. 20) These 24 agencies are the Departments of Agriculture, Commerce, Defense, Education, Energy, Health and Human Services, Homeland Security, Housing and Urban Development, the Interior, Justice, Labor, State, Transportation, the Treasury, and Veterans Affairs, as well as the Agency for International Development, Environmental Protection Agency, General Services Administration, National Aeronautics and Space Administration, National Science Foundation, Office of Personnel Management, Small Business Administration, Social Security Administration, and the U.S. Army Corps of Engineers Civil Works program. 21) These 24 agencies are those covered by the Chief Financial Officers Act of 1990, which are subject to GPRAMAs requirements. See GAO, Managing for Results: Data-Driven Performance Reviews Show Promise but Agencies Should Explore How to Involve Other Relevant Agencies, GAO-13-228 (Washington, D.C.: Feb. 27, 2013). 22) 31 U.S.C. §§ 1120(a)(1),1115(a). See also GAO, Managing for Results: GAOs Work Related to the Interim Crosscutting Priority Goals under the GPRA Modernization Act, GAO-12-620R (Washington, D.C.: May 31, 2012). 24) GAO, Results-Oriented Government: Practices That Can Help Enhance and Sustain Collaboration among Federal Agencies, GAO-06-15 (Washington, D.C.: Oct. 21, 2005) and Managing for Results: Key Considerations for Implementing Interagency Collaborative Mechanisms, GAO-12-1022 (Washington, D.C.: Sept. 27, 2012). 25) GAO, Streamlining Government: Key Practices from Select Efficiency Initiatives Should Be Shared Governmentwide, GAO-11-908 (Washington, D.C.: Sept. 30, 2011). 26) GAO, Streamlining Government: Questions to Consider When Evaluating Proposals to Consolidate Physical Infrastructure and Management Functions, GAO-12-542 (Washington, D.C.: May 23, 2012). 27) GAO-12-621SP and GAO, Managing for Results: Opportunities for Congress to Address Government Performance Issues, GAO-12-215R (Washington, D.C.: Dec. 9, 2011). For example, three case studies from our June 2012 report demonstrate how Congress has used performance information to inform its decision making. The case studies covered efforts to (1) transform the processing of immigration benefits, (2) coordinate U.S. efforts to address the global HIV/AIDS pandemic, and (3) identify and address improper payments made by federal programs. ). 28) Moving Ahead for Progress in the 21st Century Act, Pub. L. No. 112-141, 126 Stat. 405 (2012). 29) To date, this work has not identified a basis for proposing specific funding rescissions. 30) We recognize that there could be instances where some degree of program fragmentation, overlap, and duplication, may be warranted due to the nature or magnitude of the federal effort. 31) The MAX Information System is used to support the federal budget process. The system has the capability to collect, validate, analyze, model, and publish information relating to government-wide management and budgeting activities and can also be used as an information sharing and communication portal between government organizations. 32) GAO, Results-Oriented Government: Practices That Can Help Enhance and Sustain Collaboration among Federal Agencies, GAO-06-15 (Washington, D.C.: Oct. 21, 2005). 33) GAO, Managing for Results: A Guide for Using the GPRA Modernization Act to Help Inform Congressional Decision Making, GAO-12-621SP (Washington, D.C.: June 15, 2012). 34) We are not assessing 9 actions this year that were previously included in our 2011 and 2012 reports. Based on subsequent audit work that we conducted, these actions have either been consolidated, redirected from a Congressional to an executive branch action, or revised to reflect updated information or data that we obtained. Further, 16 actions reported in 2011 and 2012 were revised this year due to additional audit work or other information GAO considered.